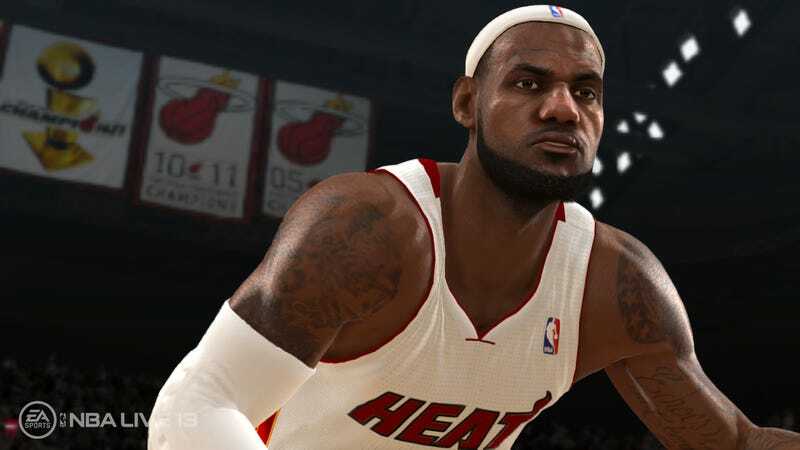 My exclusive first look at NBA Live 13 was illustrated by a screen that was a deliberately chosen tease. EA Sports wanted to show a little leg on Friday before giving you the full monty at E3. The publisher just released a batch of five screens showing off the player modeling in the game, but pay attention to the features in the background as well. LeBron James (above) is framed with the Miami Heat's championship banners (yes, they have won them. Even an Eastern Conference title with him.) Rip Hamilton was picked for his facemask, and also for the crowd and the laser-scanned American Airlines Arena in the background. Judging by the background in the Baron Davis image, I'd say they scanned Madison Square Garden, but I'm not sure. If I'm not mistaken, EA Sports hasn't had the rights to that arena (they are separate from the league rights) in either NHL or Fight Night. Tyson Chandler's tattoos and Kevin Garnett's sweaty sheen are also deliberately chosen. Amaré Stoudemire driving on Pau Gasol is probably meant to highlight the signature sneakers the players wear. I've already seen the NBA Live 13 E3 showcase but I'll be stopping by the booth to pick up more details on the game, set for release on Oct. 2.